Today I present to you one of my newest favorite things! 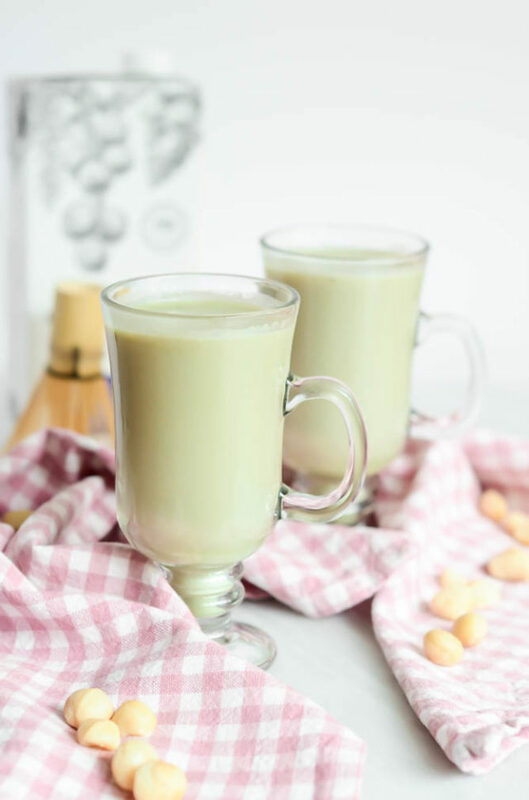 Matcha Macadamia Lattes have completely stolen my heart, and I’m not one bit upset about it. It’s no secret that nut milks have become one of the hottest food trends over the past decade. They’re now mainstream at Starbucks and often the main form of calcium and protein you’ll find in any semi-health conscious person’s kitchen. In fact, you might be hard pressed to find a gallon of regular milk in anyone’s refrigerator these days. While the hubby and I are certainly not lactose-intolerant, we keep a stash of unsweetened vanilla almond milk on hand as our main “milk” source for two primary reasons: (1) We love adding it to our morning Power Protein Smoothie and (2) It is shelf stable until opened and keeps much longer than regular milk, so we don’t have to worry so much about spoilage. 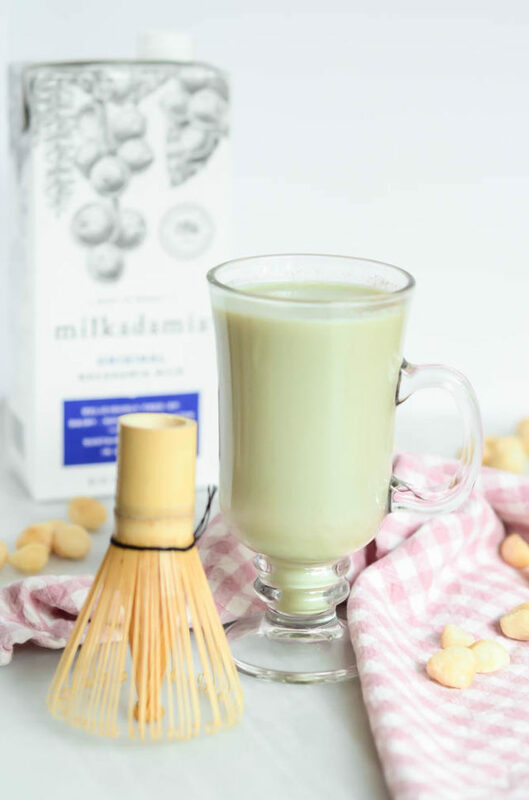 Almond and cashew milks have proven to be the reigning stars of the nut milk world, but on our trip to Kauai this past July, I ordered a Macadamia Latte and was soooo excited to learn that no, it was not flavored with overly sweet macadamia nut flavored syrup, but it was in fact made with macadamia nut MILK. I knew I had to get my hands on some as soon as we got home, and get my hands on some I did. I found this Milkadamia brand on Amazon, and also discovered that our local, slightly more “upscale” grocery store stocked the same brand. Since we don’t own an espresso machine (yet), I started out by adding it to my regular ol’ cup of half-caf joe in the morning in lieu of creamer, but I was still craving more of that macadamia flavor. I started brainstorming how I could make my latte without an espresso machine, and remembered that I had a stash of matcha in the pantry alongside a brand new matcha whisk. 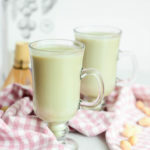 I immediately knew what I wanted to do with my macadamia nut milk and I had to do it ASAP! 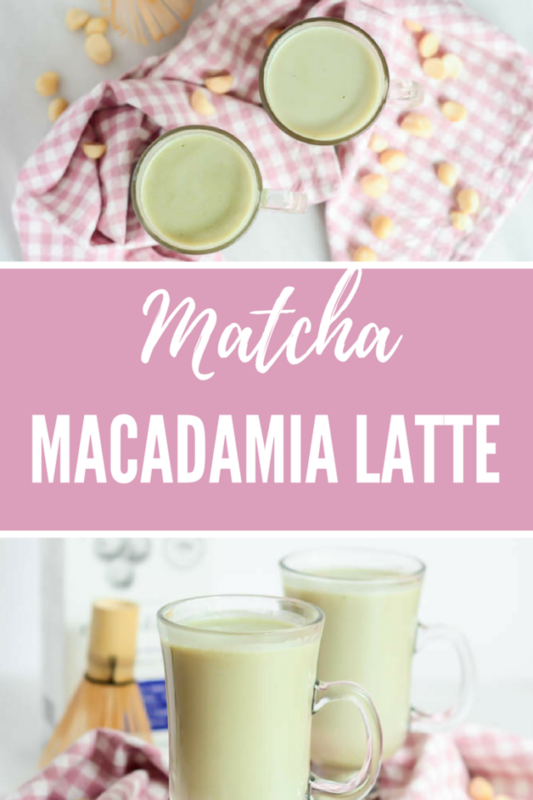 So aside from making Matcha Macadamia Lattes all day every day this weekend, what else have you got planned? We’re taking it easy with a quiet Saturday at home, then we’re headed to Ojai on Sunday for a quick overnight stay – our last little getaway before baby comes! We won’t have too much time there but are trying to squeeze in as much as possible. Any suggestions for what we should do or, more importantly, where we should eat? 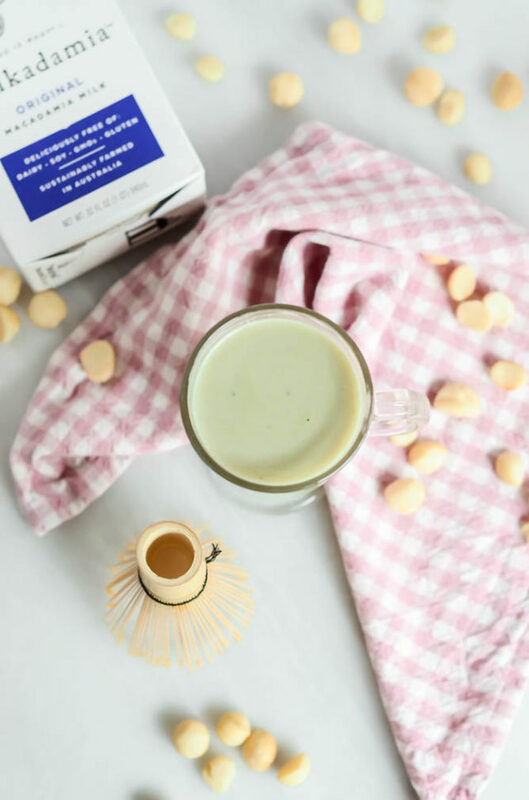 Your matcha will never be the same when you turn it into a latte with creamy macadamia nut milk and a touch of honey. It's to die for! Heat up milk (either on the stovetop or in the microwave) and then whisk in matcha powder. Divide among two mugs and sweeten with honey, if desired. The best Monday breakfast you could ever hope for. That’s right. 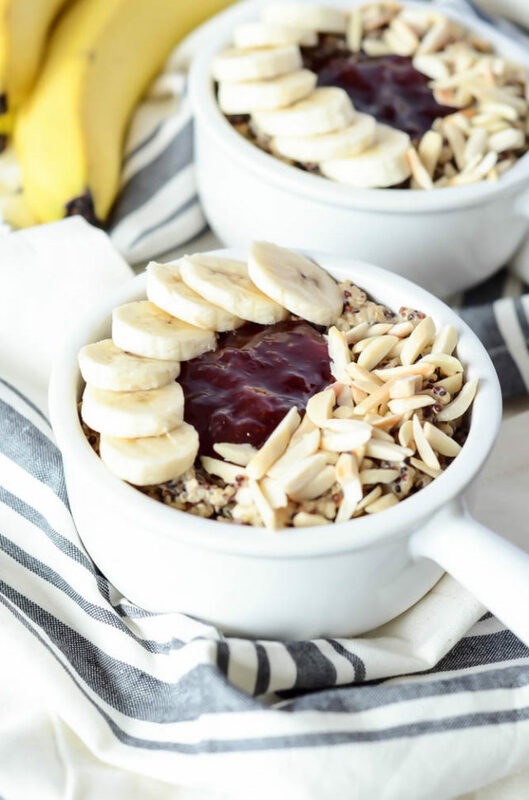 This PB&J Quinoa Bowl will change the way you view beginning-of-the-week breakfasts forever, and I don’t think you’ll be one bit mad about it. I don’t know about you, but the weekends always feel like a crazy whirlwind of fun for me, and it’s always just a little bit tough to go to bed on Sunday night knowing I have to wake up and face the “real world” the next day. Yes, I work from home and yes, many feel that’s quite the luxury, but I promise it’s still not easy. If anything, I feel more accountable for being productive, especially after an event-filled weekend like the one I just had. I’ve been up north at the parents’ house since last Wednesday and I’ll actually be working from up here for the next week due to a heavy influx of close friend and family obligations. I helped cater one of my good friends’ baby showers this past Saturday and next weekend we have a family birthday party, so I just decided to forego 8 extra hours in the car (no bueno for a pregnant mamma!) and stay up here for the week. The downside of that is, now I’m here surrounded by family, and they all have fun, exciting things that they want to do, yet I still need to be sure I find the time to actually WORK and get done what I need to get done since I’m still held accountable for doing my job, even when I’m not physically at my “home base.” Does anyone else struggle with this? Please tell me you do and give me pointers! 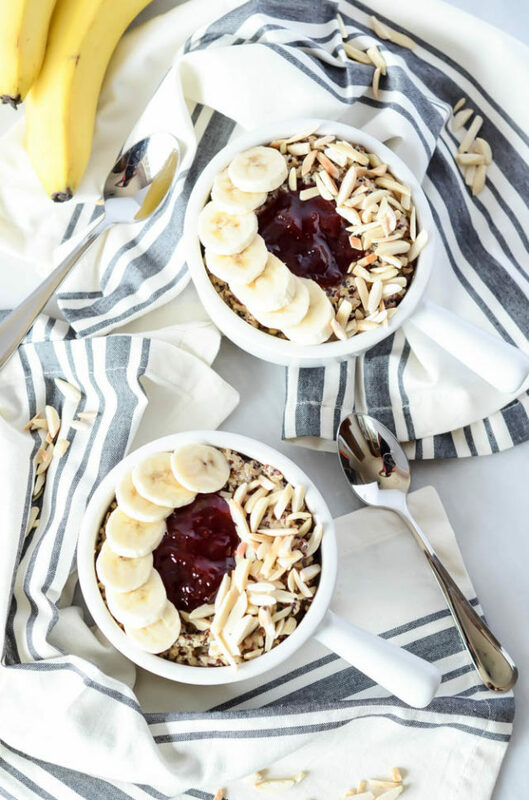 But enough about my time management/life balancing skills, let’s talk about what we REALLY need to get out on the table today (both literally and figuratively) – these PB&J Quinoa Bowls! Real life talk: this is another recipe where I have to give all creative credit to a favorite eating establishment of mine. 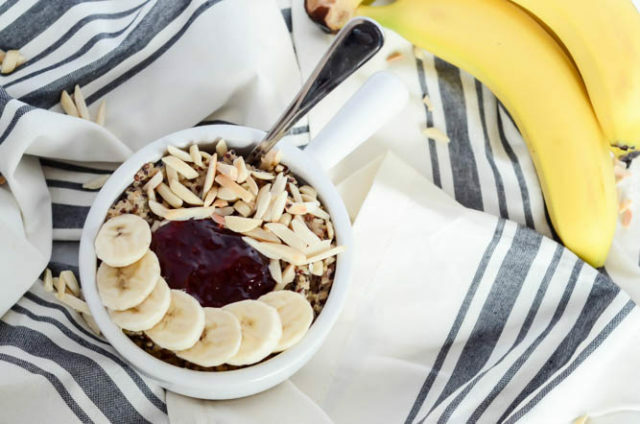 When I first moved to Santa Barbara, one of the things I remember being most excited about was the fact that they had an entire eatery based around the concept of one of my favorite breakfasts – the acai bowl! Yes, I get excited about these things because, hey, I am a food blogger. And there most definitely were no such places in Napa, where I lived previously. 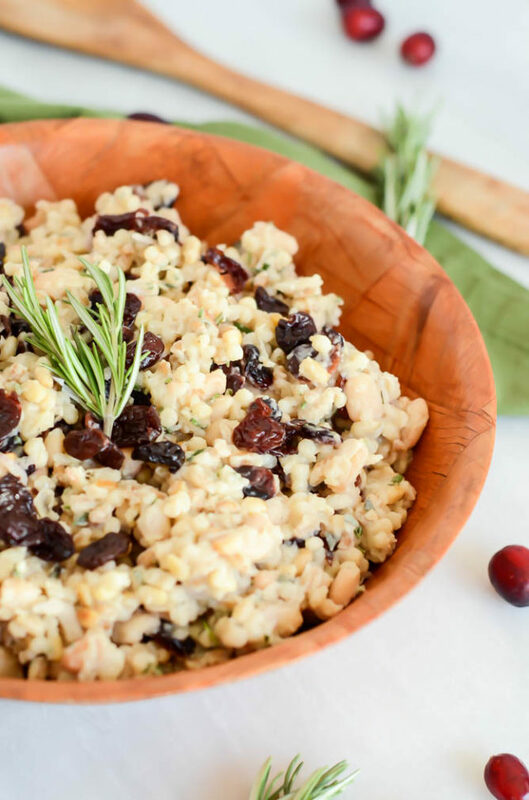 Let me tell you a little bit about Backyard Bowls and why it is so amazing. Well, they literally have any sort of acai bowl you can imagine – green bowls, power bowls, tropical bowls – you name it! Then on top of that they have a whole list of smoothies, PLUS a line of non-acai bowls that are also healthy and taste absolutely amazing. This is the section of the menu where the PB&J Quinoa Bowl resides. 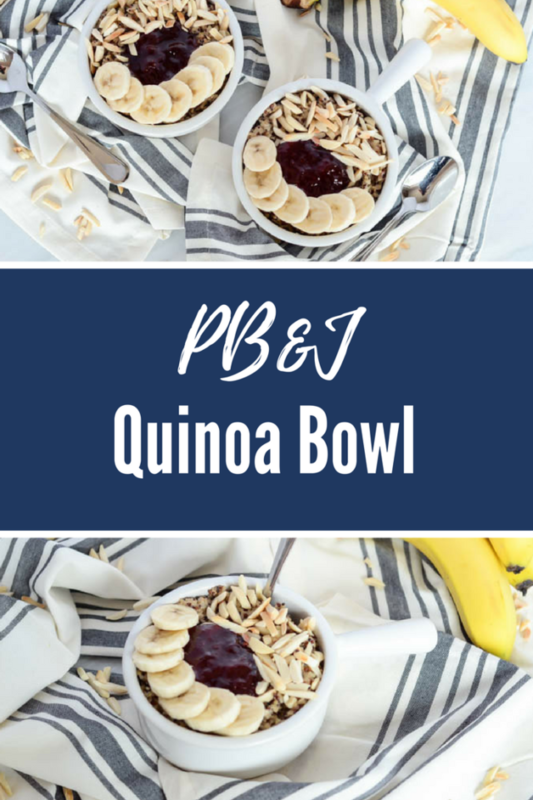 When I was still working in a “real office” full time, a PB&J Quinoa Bowl from Backyard Bowls was one of my favorite breakfasts to pick up on my way to work and eat at my desk, especially if I had a long day ahead of me where I didn’t know what time I’d be able to get to any sort of lunch. 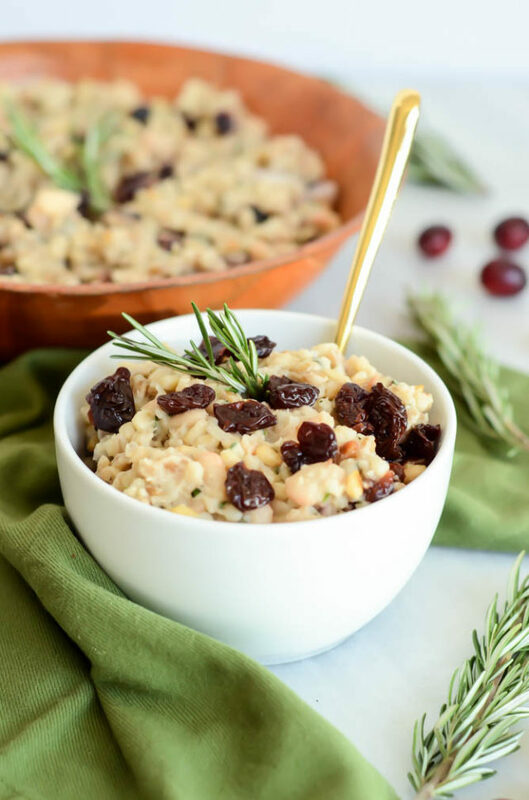 It’s chock full of protein, yet still tastes indulgent at the same time. And the quinoa, oh the quinoa. 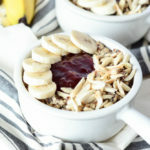 If you have never ventured into the world of quinoa served oatmeal-style for breakfast, I highly recommend you do so soon (you can try this Banana Peach Breakfast Quinoa with Cinnamon Sugar Pecans while you’re at it.) 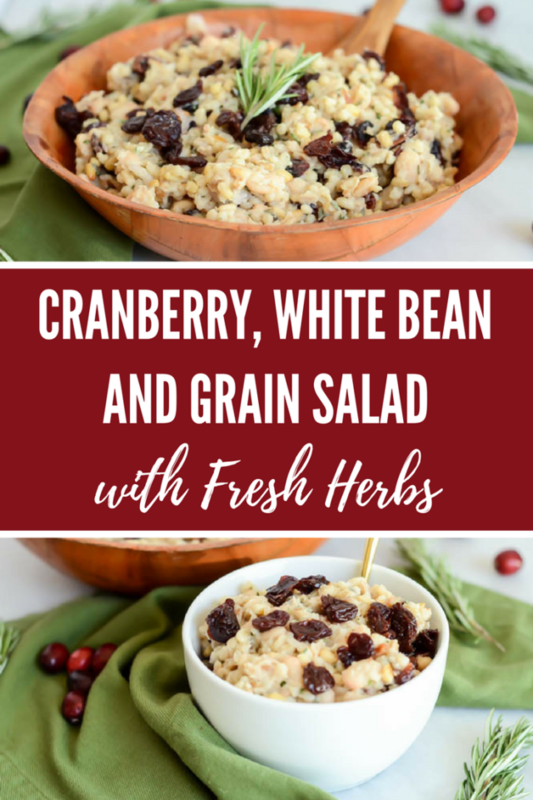 It is so tasty, super healthy, and full of protein. 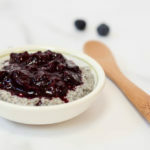 And yes, quinoa tastes just as good with sweet breakfast-y ingredients as it does with savory dinner-y ingredients. 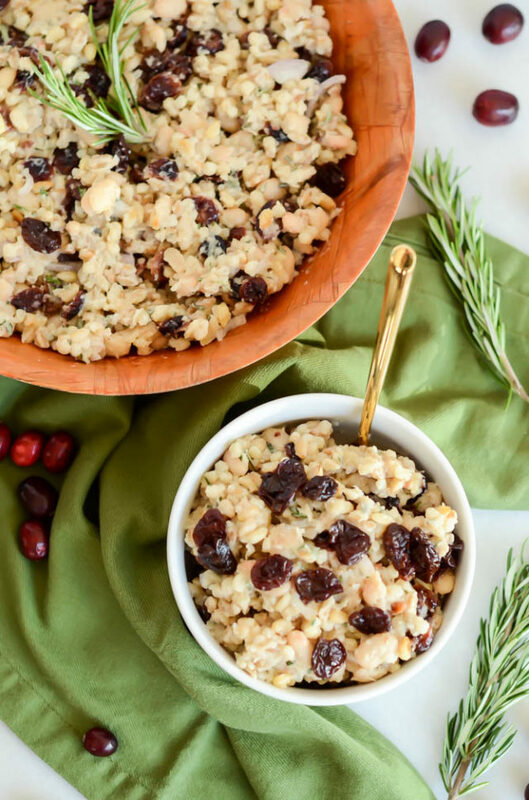 So here’s the PB&J Quinoa Bowl scoop: First off, you literally cook it just as you would oatmeal. And instead of cooking it using water as the liquid, you’ll use good ol’ cashew milk. 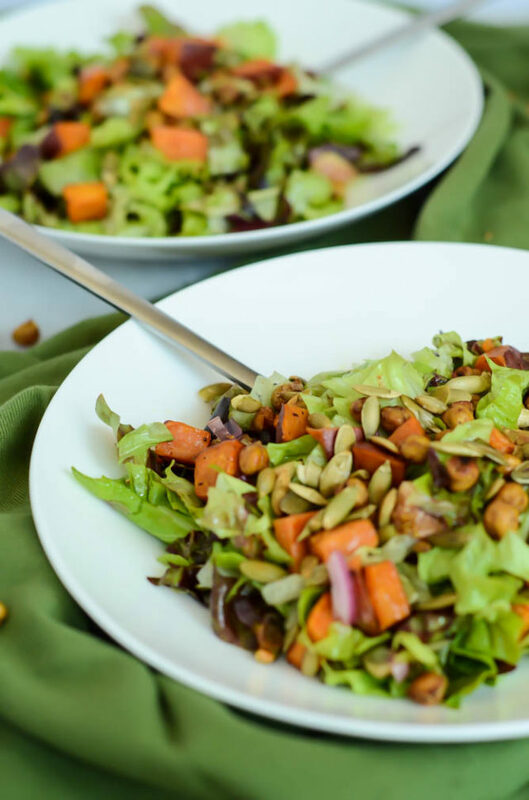 In fact, you could really use any sort of regular OR nut milk, I just used cashew because I was trying to really capture Backyard Bowls’ take on the whole thing and that’s what they use. But it’s totally up to you! Once the quinoa is cooked (but while it’s still warm) you’ll stir in a little additional cashew (or other) milk along with your favorite peanut butter to make it extra creamy. That’s it as far as cooking goes! 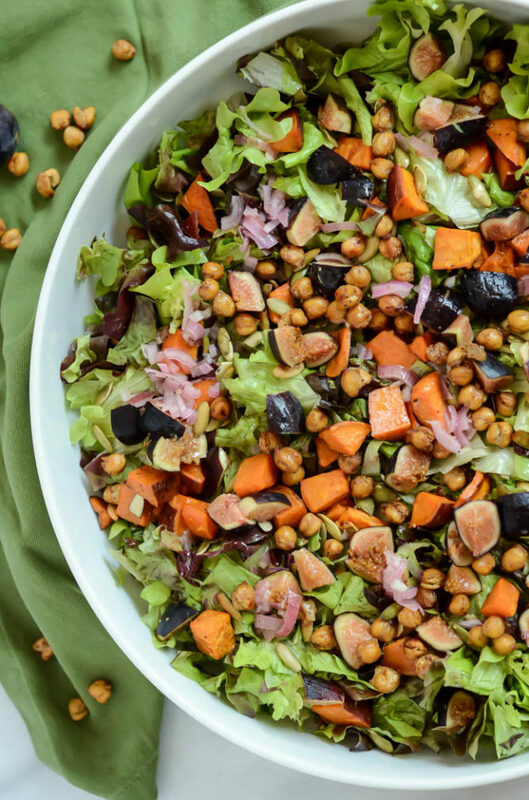 The next bit, the toppings, is what really takes your PB&J Quinoa Bowl over the edge. First off, your favorite jelly is KEY. I’m quite the traditionalist and prefer to stick to strawberry jam, but feel free to use your own creative license here and use whatever your little heart desires. 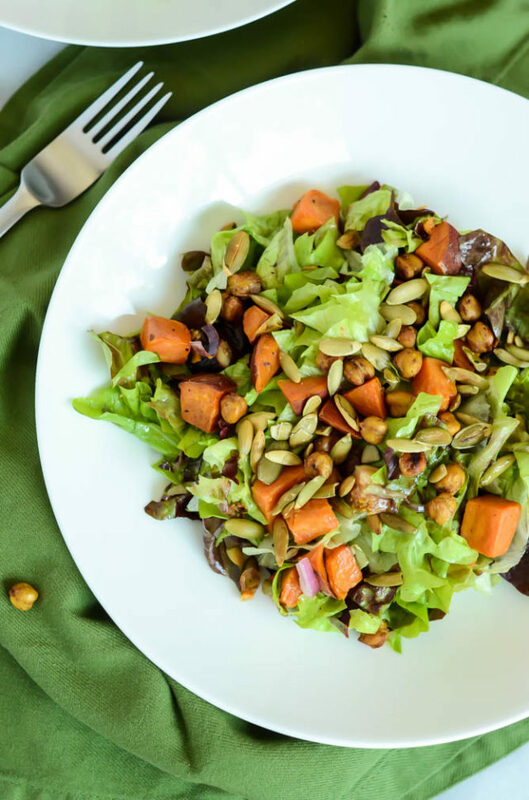 Next, you’ll want to add some texture with nicely toasted slivered almonds. 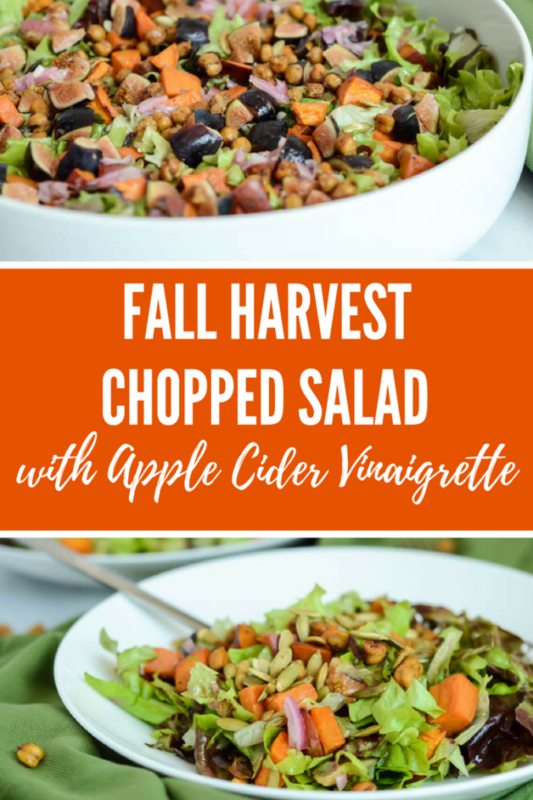 They add the perfect crunch to an otherwise texturally one-dimensional bowl. 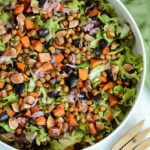 And are such a fun contrast to the peanut butter! Finally, slice up some fresh banana and fan that out over top. 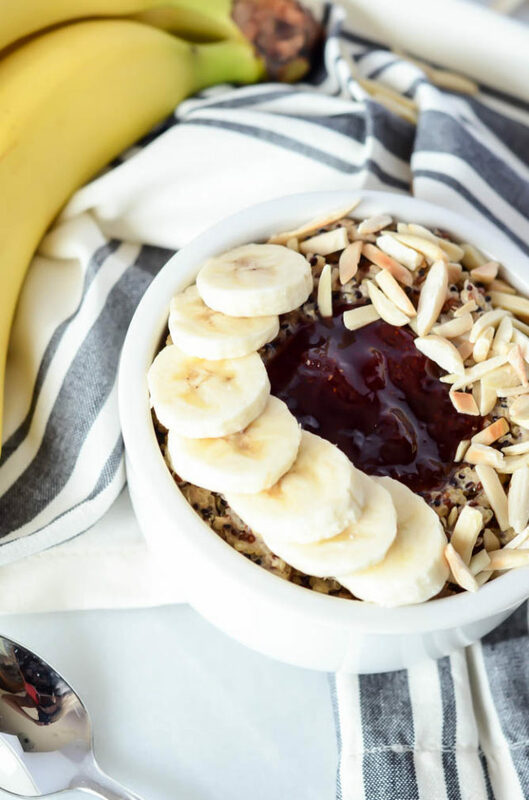 Because what’s a breakfast bowl without a sliced banana topping? 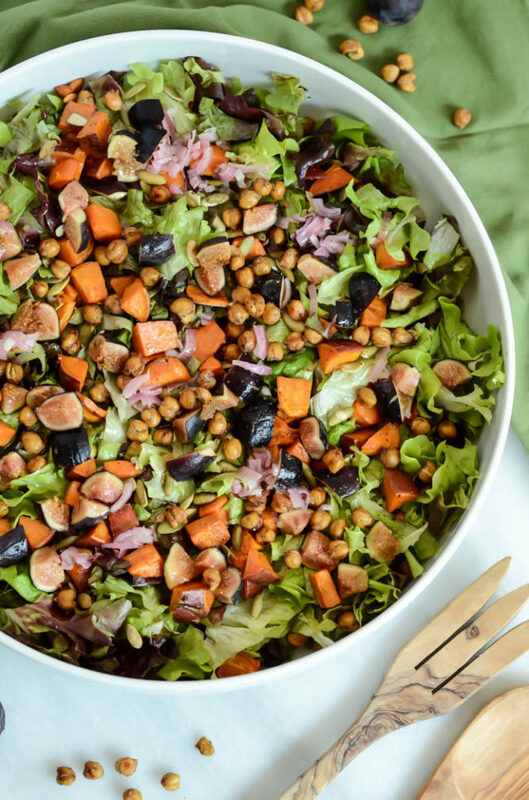 Long story short, this PB&J Quinoa Bowl is a super easy and insanely delicious recipe that needs to make an appearance in your kitchen ASAP. It’s the perfect breakfast to really turn a week around and I guarantee you won’t be mad about it once your piping hot bowl is sitting in front of you on a Monday morning before heading to work. 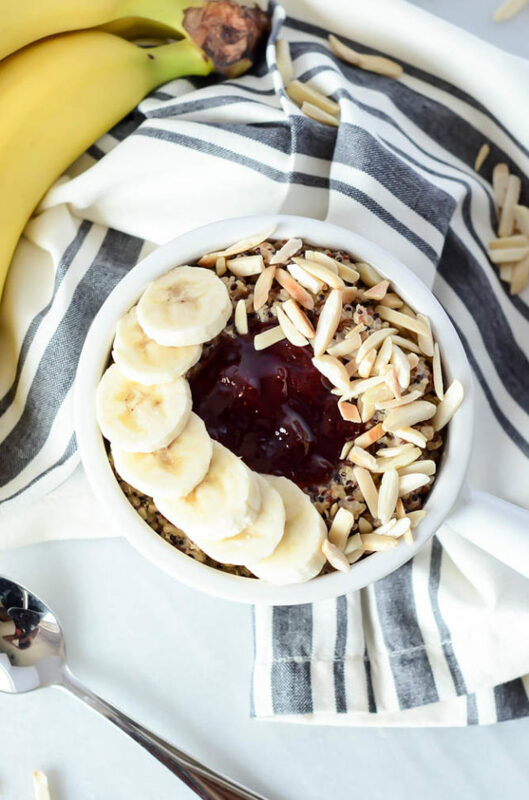 Protein-packed quinoa gets a morning makeover when cooked with your favorite nut milk and swirled with peanut butter and jam, plus even more delicious toppings! 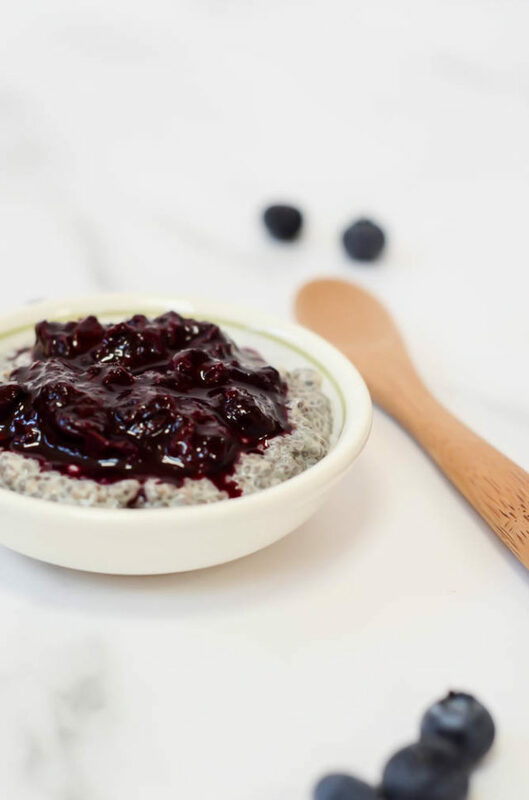 Bring quinoa, 2 ½ cups of the cashew milk and honey to a boil in a medium saucepan, stirring occasionally. Turn down the heat to a low simmer, cover and cook for 10 more minutes. 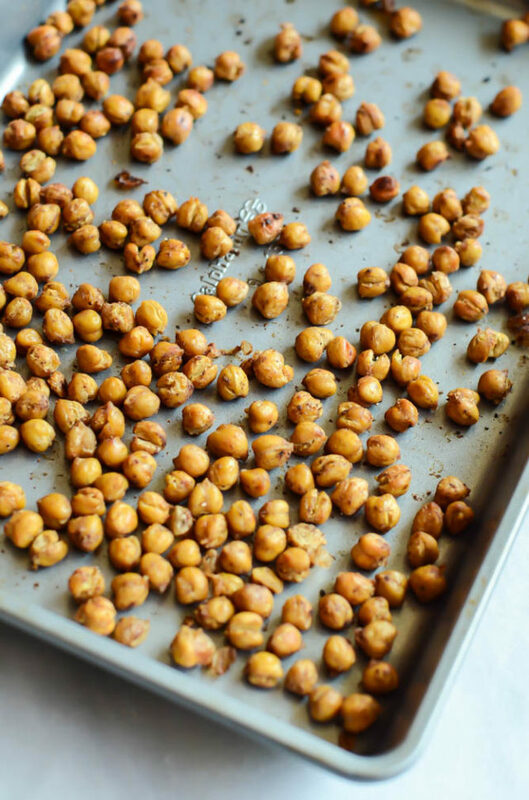 Turn off the heat and stir in additional ½ cup of cashew milk, salt and peanut butter. Scoop quinoa into 2-4 bowls and top with strawberry jelly, almonds, banana and more peanut butter, if desired.